Reflected ceiling plans (RCP) are used by architects and designers when planning the interiors of a building. A reflected ceiling plan shows the interior elements on the ceiling. It looks like a reflection of the ceiling on the floor. Making an RCP involves many different reflected ceiling plan symbols showing the location of the design elements and hanging equipment that may be suspended from the ceiling. A reflected ceiling plan drawing can be easily managed using ConceptDraw DIAGRAM. The ability to create reflected ceiling plan is delivered by Reflected Ceiling Plans Solution. This solution extends ConceptDraw DIAGRAM with 8 libraries containing 316 vector objects of reflected ceiling ideas. Open a ConceptDraw DIAGRAM v12 new document and select the libraries from the Reflected Ceiling Plans Plans solution. Also, you may need some libraries from the Floor Plans solution. Set the page size and orientation using the Document Properties panel. Select the measurement units for your document by clicking on the intersection of the vertical and horizontal rulers. Open the Reflected Ceiling Plans library and add objects to the drawing by dragging them from the libraries panel to the document page. Use the “Dimensioning” library to indicate the sizes, corners, squares and other technical details using the current measurements of units. 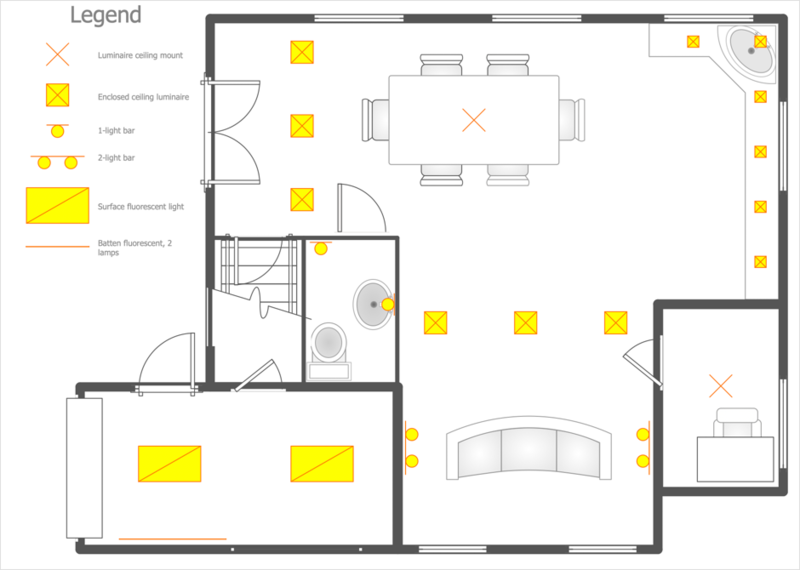 Add a legend explaining the symbols on the Reflected ceiling plan using the Text tool. Result: Using ConceptDraw DIAGRAM v12 you can design the reflected ceiling floor plan that shows the location of light fixtures and any other items that may be suspended from the ceiling. You can share your design ideas by saving drawings as graphics files, or printing them.